I started experimenting in the dyepots last summer, and found that I absolutely love the challenge of hand-dyeing yarn. It is a different creative process than knitwear design, but I think it compliments it perfectly and will allow me to explore both in more depth. Yarns are available for purchase in my HandmaineKnits Etsy shop. The Maine Collection: This first line of colors I have developed is inspired by the beauty I am surrounded with living in Maine. I grew up in the Midwest, so of course, one of the most impressive aspects of living in Maine is the ocean. Thunder Hole is a small inlet carved in the rocky coast of Acadia National Park. When the waves roll in, you can experience the thunderous power of the sea. This colorway is a deep, moody, tonal teal with a navy glaze and is finished with green and brown speckles. The ragged ledges of Pemaquid Point is one of my family's favorite Maine landmarks, and a spectacular example of the Maine coastline. This colorway is a pale, rocky, warm 'greige' with earthy gold, teal, and brown speckles. Maine is a very rural state with a low-level of light pollution and it has the largest stretch of dark-sky in the Eastern United States. Still, I am amazed at the celestial display every time I look up at Maine’s night sky. This colorway is a dark grey with blue undertones and specks of gold, green, and red, all laced with the mysteries of the midnight sky. 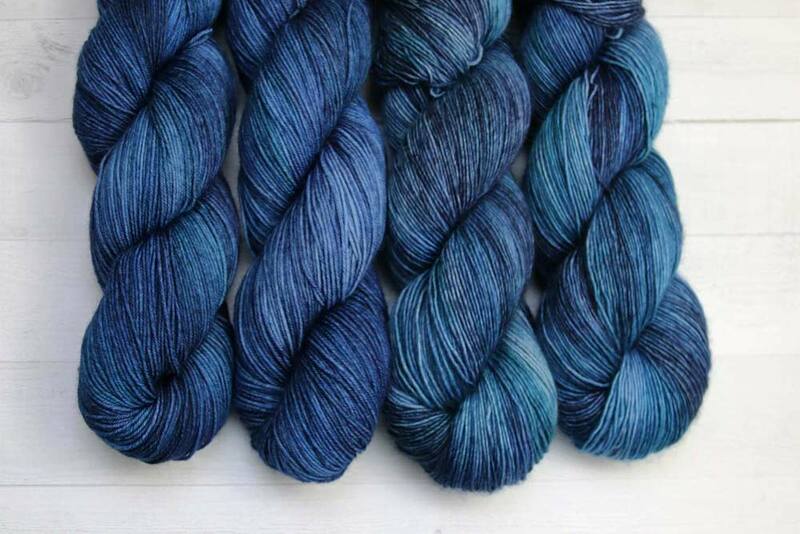 The Night Sky Sock Set comes with two 10 gram mini-skeins - Blue Moon and Golden Glow - for knitting contrasting heels and toes. In November, the Coastal Maine Botanical Gardens transforms itself into an inspiring winter wonderland with its magnificent lights display. It takes me back to my childhood and the excitement I would feel when the neighborhood was aglow in color. Gardens Aglow has an icy teal tonal base lit up with emerald, sapphire, amber, and ruby speckles, and the magic of holiday lights. The Gardens Aglow Sock Set comes with two 10 gram mini-skeins - Golden Glow and Christmas Cactus - for knitting contrasting heels and toes.